Our Unique Approach | David C. Wright, M.D. Daily IV therapy, no PICC line required. Dr. Wright sees his infusion patients in the Infusion Center for every day of their IV therapy, which allows him to monitor their progress, track daily vital signs, and personally administer treatment. 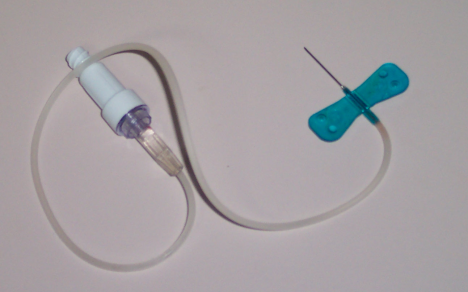 Rather than subject patients to the risks and cost of a PICC line, for most treatments, we use a 23 gauge butterfly needle, inserted into the back of the patient’s hand. Because the needle is so small, it causes very little discomfort and almost no bruising or scarring. Dr. Wright prepares each patient’s drug in a sterile hood no sooner than one hour before his or her appointment. This ensures that the drug is as effective as possible. Most daily treatments take 45 minutes to an hour. When treatment concludes for the day, the needle is removed, and the patient is free to shower, swim, play sports, and do other normal activities.